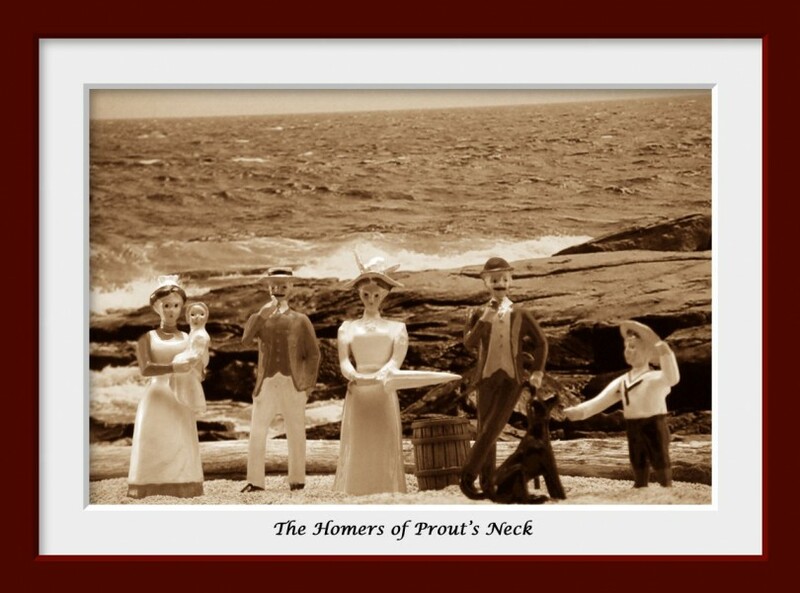 "The Homers of Prout's Neck"
This photograph shows 19th C American artist Winslow Homer with his younger brother Arthur and his family at their summer retreat at Prout's Neck, Maine. Homer's brother and his family live in Galveston, Texas where he is a prominent businessman. During the summer months they like to escape the Texas heat for the rocky shores of Maine, where Winslow has his studio. Nursemaid Mary O'Donnell (originally from Dublin, Ireland) holding Arthur's youngest son Charles, Arthur Benson Homer, Alice Patch Homer his wife, Winslow Homer, Winslow's dog Sam and Arthur's oldest son Arthur Patch Homer. Randy, your displays with these Hocker civilian figures, partiuclarly the Winslow Homer scenes, are great! Winslow Homer's "A Veteran in a New Field" is my favorite painting by him. I have been a student of Homer since 1965 and have studied with two major Homer scholars at the undergraduate and graduate levels. I have taught courses on Homer's art at Syracuse University and Keene State college. Living in New England is real bonus for this subject. Veteran in A New Field is filled with all kinds of symbolism about the war and the future of postwar America. Battles such as Gettysburg took place in wheatfields and death was their to reap the harvest. In Homer's Veteran painting swords have been turned into ploughshares. 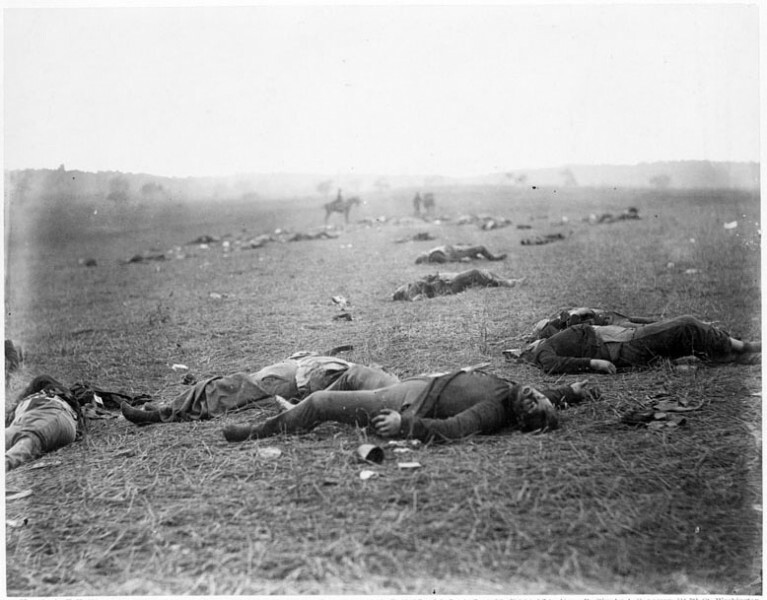 Timothy O'Sullivan's photograph "A Harvest of Death" was taken at Gettysburg. Wow! Randy, you know more about Winslow Homer than I do about toy soldiers! "A Veteran in a New Field" always struck me as a very moving portrait of how Americans & America heals itself and goes back to their trades/calls-of-living after the wars are over. Any of these old photographs of battlefield casualties from the American Civil War are very moving and thought-provoking. Especially when you visit the actual photographic-sites for example the Turnpike Confederate dead & The Sunken Road Confederate dead at Antietam National Battlefield Park. Soldiers from both sides at these sites were loading/blasting away at each other from only 10-50 yards apart. Americans fighting, wounding and killing Americans over their passionate beliefs for four years...so very sad for time immemorial. Antietam National Battlefield Historial Photographs link above.